Manufacturer & Exporter of LED Display Board. Our product range also comprises of LED Video Display, LCD Video Wall and LED Display. We are an eminent organization that is engaged in manufacturing, supplying, trading and exporting LED Display Board. The experienced and qualified professionals working in our team manufacture the offered range of display boards using high quality components that are sourced from certified vendors of the market. We offer these boards to our esteemed clients in various configurations at reasonable prices. 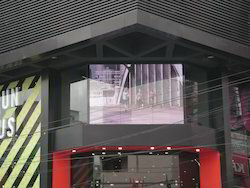 Looking for LED Display Board ?